For teachers, who understand the power of visual meditation and learning, the Inspired through Art series provide ample opportunities to teach the faith with stunningly beautiful and intriguing images. The series is a type of "cross-curriculum" of art history and catechetics, where pre-teen to adult students learn about the artist, the art form and the lesson of faith presented in the work of art. Every print issue's centerfold has a full-color spread of various art forms from different periods. And you'll be surprised at what some of the works of art teach, and at how deeply the artists meditated on the subject they were presenting! What may appear to be irrelevant details, may be very relevant. For example, in the art carousel on the home page, there is an image of the Last Supper (the actual translation from Italian, the Ultimate Supper). Answer to "What does the peacock in the window represent?" is: immortality. Read the article and find out why. In the past, some teachers have laminated the centerfold in order to present the art in class. Now, more and more people are using computer projection technology to make it easier for students to see and follow along with the lesson. 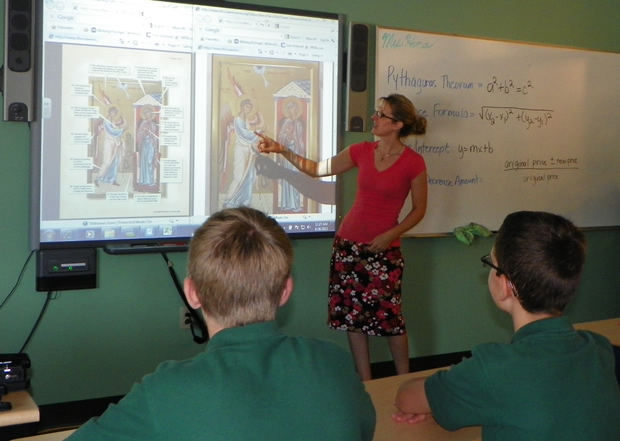 With a subscription to The Catechetical Review, people can also go online to back issues of the magazines they have missed and utilize many different works of art to teach the faith or to use as a backdrop to a time of prayer and meditation, for example at the beginning a class to aid students in putting themselves in the presence of God. The text articles may be downloaded and reproduced in order to facilitate group studies. Try a sample for free here. Answer to "Can you guess which saint this is?" on the home page: St. Michael the Archangel, by modern artist Michael O'Brien of Canada.